“There’s something very special about Lanesboro,” says Steve Harris. Harris, along with his wife Susie, moved to Lanesboro in 2009, when the two assumed ownership of Anna V’s Bed and Breakfast. Since then, Harris has immersed himself in the Lanesboro community. 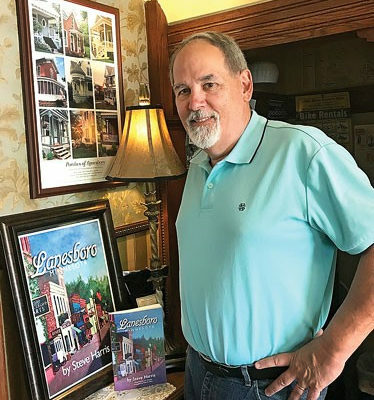 He serves as a board member of Lanesboro Arts; he is involved with the “Over the Back Fence” Community Variety Show and Lanesboro Community Theater; and his book, Lanesboro, Minnesota, can be purchased in shops throughout the town. “We immediately fell in love with the town,” says Harris. The couple previously lived in the Twin Cities, where Harris served as Director of Philanthropic Communications for the YMCA of the Greater Twin Cities. He specifically praises the peace and quiet of Lanesboro, as well as the energy of its arts scene.